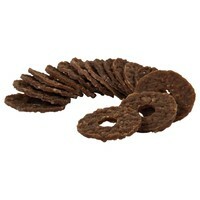 Busy Buddy Rawhide Treat Ring Refills are for use with Busy Buddy treat-holding toys. Refill your dog’s toy for more chewing, more playtime and more fun. Alternatively the treats can be given as a solo treat on their own. My clients are always asking me for these! A real favourite because the toys last so long! Both my dogs REALLY love these. Use with the bristle bone and the standard bone. Need to use the larger size as the medium are too small for my GSD to get into. Last quite a while compared to other chews. These are really easy to use with the bouncy bone or bristle bone. The taste of the rawhide really encourages them to clean their teeth. Works really well. Our dog enjoys chewing on these which we cleverly hide in her bristle bone. Helps her to concentrate and keeps her occupied for ages while she tries to get a piece off to chew on. They fit the bristle bone perfectly but I think I would have preferred them slightly larger as they are flush with bone and as they get smaller, our dog seems to have more difficulty in working pieces off.